Can Antibiotics Cause Tendon Damage? What Is the Outcome of Tendon Damage? Yes, it's true. In some cases, antibiotics called fluoroquinolones can cause the tendons to weaken, leading to damage, and in some cases, complete tendon rupture. In the past, doctors did not hesitate to prescribe common fluoroquinolones such as Cipro and Levaquin to their patients for the treatment of sinus infections, urinary tract infections, kidney infections and much more. Recently, however, doctors have been more cautious about writing prescriptions for fluoroquinolones. This is due to the mounting evidence that suggests these antibiotics can cause serious tendon injury. The FDA first warned the public about these dangers in 2008, and have continued to make drug safety announcements on their website as recently as July 2016. These warnings from the FDA have gotten more and more serious over the years. In 2008, the FDA announced the requirement for all fluoroquinolones to be labeled with a "black box" warning on the outside regarding potential tendon damage. In 2013, the FDA's announcement about fluoroquinolones included a warning about potential nerve damage from usage of the antibiotics. In May of 2016, the FDA's warning stated that fluoroquinolones should only be used as a last ditch effort if other drugs have failed and there are no other options. The tendon most likely to be damaged by taking fluoroquinolones is the Achilles Tendon (located at the back of your ankle), but the other tendons in your body are also at risk. Who Is At Risk of Tendon Damage Caused By Antibiotics? 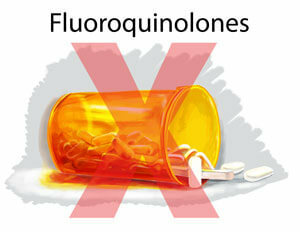 Anyone who has taken fluoroquinolones within the past several years is potentially at risk. You aren't just at risk while you're actively taking the drugs -- tendon injury associated with the use of fluoroquinolones can show up several weeks, months, or even years after you stopped taking the drugs. The longer you took the antibiotics and the higher your dosage, the more likely you are to experience tendon damage. There are also certain outside factors that increase your chances of tendon damage. For one, if you are over the age of 40, your risk increases because our tendons naturally grow weaker as we age. Another risk factor is using corticosteroids, as they can also contribute to the weakening of tendons. If you've used fluoroquinolones and have a history of taking corticosteroids for something like arthritis or asthma, you are at greater risk of developing a tendon injury. Being physically active is probably the biggest risk factor. When you're active, you have a much greater chance of injuring a tendon than someone who doesn't lead an active lifestyle. Your risk of tendon damage increases further if you've injured a tendon in the past. Tendon damage ranges from mild, to moderate, to severe. Tendon injuries are usually described as "Grades" that include Grade 1 (mild strain), Grade 2 (moderate tear), and Grade 3 (full tear). A Grade 1 tendon injury is a mild strain of the tissue that can cause pain and swelling, but shouldn't affect movement of the joint. A Grade 2 tendon injury is a partial tear of the tissue, which means the tissue has been torn but is still holding together. 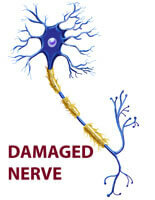 Signs and symptoms may include pain, inflammation and reduced range of motion. 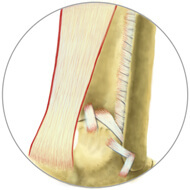 A Grade 3 tendon injury is a complete tear, also called a rupture. This means your tissue is in two separate pieces. You will likely experience severe pain, inflammation, possible bruising and reduced range of motion, or inability to bear weight on the joint (depending on the location of the damaged tendon). 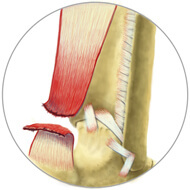 Grade 3 tendon tears are very serious and usually require surgery to repair. It doesn't matter how severe your tendon damage is -- tendon injuries can take weeks or even months to heal, putting your life on hold and even causing permanent damage. Start with the ColdCure® Wrap to relieve the pain and reduce any swelling and inflammation. Use the ColdCure® Wrap in cycles of 20 minutes on and 20 minutes off for as long as is needed. Continue doing ColdCure® treatments until any external swelling is gone and the pain has been reduced. 5-10 minute BFST® treatments, you can start doing treatments for the full 20 minutes. Try doing 3-4 full 20 minute BFST® treatments every day, as this will work to promote blood flow and improve your circulation, helping to heal your tendon damage. We have products for the Achilles, Elbow, Back/Hip, Knee, Foot, Ankle and Wrist on our Shop. Click here to see the products you need to heal your tendon injury. The purchase of every ColdCure® and BFST® Wrap comes with the free professional consulting services of our King Brand® Advisors. This is a huge benefit in terms of your treatments and overall recovery. Our Advisors are extremely knowledgeable when it comes to tendon injuries. They're also trained extensively on BFST® and ColdCure® technology and treatments. One of our Advisors will contact you several days after your order has been delivered to see how your treatments are going and answer any questions you may have. They can even help you create a treatment plan that is tailored to your specific needs. Our Advisors are here to help you through every stage of your recovery. 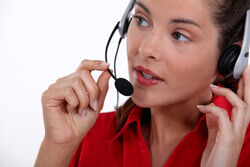 While we will follow-up with you directly, you are welcome to contact us any time. Your recovery is very important to us. 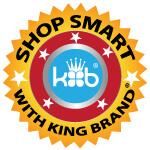 King Brand® ColdCure® and BFST® products are FDA Registered medical devices. They also comply with Health Canada, ISO 13485, ISO 10993 and IEC 60601-1 3rd Edition, among several other regulations and standards that are significant in terms of product and material safety. For example, ISO 10993 ensures that our products are made from material that is safer and higher quality than the material used to manufacture baby products, including diapers. These devices are intended to prevent, treat and cure soft tissue injuries and chronic conditions. Part of being FDA Registered means that our products are made from high quality, biocompatible materials. These devices are manufactured and tested to the highest safety standards in the industry. Note from KB WebMaster - The text below is primarily intended to assist with Google properly classifying this page content. 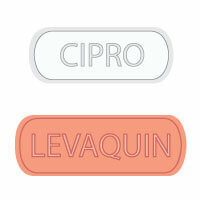 To learn more about our products please visit our website.<br>Antibiotics called fluoroquinolones in some instances. Previous tendon injury, being physically active, being over the age of 40 and having a history of taking corticosteroids can put you at greater risk of tendon damage associated with these drugs. Tendon damage ranges from mild to moderate to severe. There are three injury grades used to classify the severity of tendon injuries. Grade 1 is the least severe and is just a mild strain. 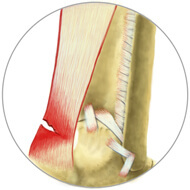 Grade 2 is a moderate tendon injury and is classified as a partial tear. 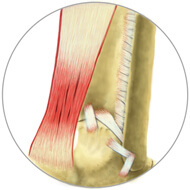 Grade 3 tendon injuries are the most severe and are classified as complete tears. This is also known as a rupture. While the Achilles Tendon is the most likely to be damaged due to the use of these antibiotics, you may also damage a tendon in your elbow, knee or ankle. BFST and ColdCure medical devices can help heal tendon injuries. BFST works to promote blood flow and accelerate healing. ColdCure relieves pain and swelling and brings down inflammation.